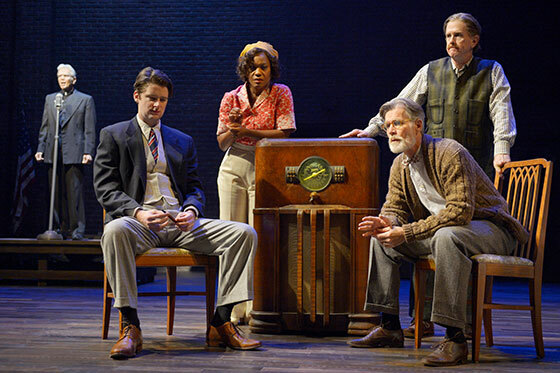 With startlingly prescient timing, Berkeley Rep’s current production is a new adaptation of Pulitzer Prize winner Sinclair Lewis’ 1935 satirical political novel, “It Can’t Happen Here.” Originally written as a warning about the dangers of Hitler’s and Mussolini’s fascism as well as Louisiana Senator Huey “Kingfish” Long’s demagoguery, “It Can’t Happen Here” translates all too well to the Presidential election of 2016. This world premiere is skillfully adapted from the novel by the Rep’s Artistic Director Tony Taccone and Bennett S. Cohen, and tautly directed by two-time Obie® Award winner Lisa Peterson, the Rep’s Associate Director. “It Can’t Happen Here” centers on a liberal journalist from small-town Vermont, Doremus Jessup (excellent Tom Nelis, “Dear Elizabeth”). He opposes the presidential candidate, Buzz Windrip (well-acted by David Kelly), a charismatic populist U.S. Senator who’s platform is to encourage nationalism and traditional values, and to promote the fear of outsiders, while promising grand economic reforms ($5,000 a year for each citizen). Jessup, in a passionless marriage to Emma (nicely played by Sharon Lockwood, “Vanya and Sonia and Masha and Spike”), with several adult children, has a soul mate in tavern owner Lorinda Pike (first-rate Deidrie Henry, “Yellowman”) who shares his values, opposes Buzz Windrip and the muzzling of a free press. Jessup gradually becomes more active in opposing Windrip, despite entreaties from his family to accept the inevitable. Early in the first act of “It Can’t Happen Here,” Windrip seems like a harmless ignorant blowhard, but I began to feel uncomfortable when a pro-Windrip supporter, an influential Father Coughlin-like radio preacher is introduced, as are anti-Semitic remarks that blame Jews and FDR for the Great Depression. “I heard his name was really Rosenvelt,” says one Windrip supporter). But those remarks are merely the tip of the totalitarian iceberg. In the second act, things go from bad to worse as now President Windrip, in absolute control of the country, harshly punishes all who oppose him, including Jessup. With concentration camps and murder replacing human rights and democracy, amusement at Windrip’s superficial resemblance to Donald Trump in the first act is replaced by alarm and dread in the second act. Talk about a cautionary tale! Perhaps because Taccone and Cohen adapted a 458-page novel into a two-hour play, the production takes the form of a succession of quick scenes that focus on moving the plot along rather than on character development. As a result, some of the lesser characters seem undeveloped and one-dimensional. Even Doremus Jessup seems to lack real depth, despite fine acting by Tom Nelis. Director Peterson handles the scene changes seamlessly. But I wish that there had been fewer of them. Many in the cast act more than one role, which, at times, I found a bit confusing. Sometimes a change of hat or costume isn’t enough to distinguish one character from another. Perhaps it was because some of the acting by the supporting cast was uneven and unexciting. And then there is the problem of the ending. The second act contains so many devastating occurrences, that no quick turnaround and happy ending is possible. And so the play just suddenly stops, although on a mildly optimistic note. Despite my minor grumbles, I am delighted that Berkeley Rep is holding a national series of free public readings of “It Can’t Happen Here.” It’s a story that should be heard by as many voters as possible before November 8th.